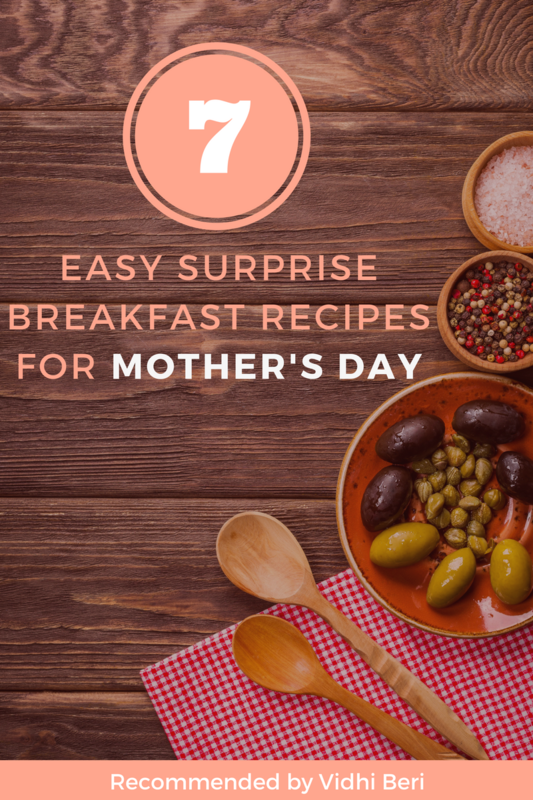 Mother Day is special for every mom and there can be no better idea than to prepare a fabulous Mother’s Day breakfast. This will surely make her feel so much loved. The best idea is to connect over a fabulous spread of food. Most of the mothers today are very health conscious and it's a great idea to treat them with such delicacies that can cater to their taste buds as well as help them to be in good shape. Here are some interesting recipes, which will cater to the purposes keeping your mummy’s body and soul healthy. Dark Chocolate Quinoa Breakfast Bowl: This dish is full of protein. Most importantly it take minutes to prepare it and is satisfying for your taste buds. Ingredients:1 cup uncooked quinoe, 1 cup unsweetened almond milk, 2 tbsp unsweetened cocoa powder2-3 tbsp. maple syrup, little vanilla extract,3-4 squares vegan dark chocolate(roughly chopped). For garnish and added taste you can add mixed berries, sliced bananas, dried strawberries and nuts. Instructions: Rinse quinoa in a fine mesh strainer and clean. Heat a small saucepan add rinsed quinoa and strain it and toast it for 3 minutes. Then add milk reducing heat to low flame and cook for 20-25 minutes. Finally remove from heat add the other ingredients and serve. Protein Powder Pancakes: Simple recipe and perfectly power packed to keep your mom going for the whole day. Ingredients: This three ingredients pancake recipe is dominated by three ingredients including 2 eggs,1/2 cup almond butter, 2 scoops plant based protein powder(flavor of your choice like chocolate/vanilla). Berries for garnish and 2 tbsps. maple syrup . Instructions: Place all ingredients in a blender. Blend it until pureed. You need to cook it in a skillet which has been coated with a little oil. Prepare the pancakes and serve it with berries and maple syrup. This recipe is for two servings. Ingredients: Unsweetened apple sauce, 1/3 cup almond milk,1/2 red bell pepper,1 cup cherry tomatoes halved, salt and pepper, vegetable oil . Instructions: Preheat oven to 350 degree F. In a bowl pour apple sauce and add all the other ingredients, except tomatoes. Pour the same in baking dish, put tomatoes and bake for 25-30 minutes. Almond Pudding Parfait: This is a simple yet an interesting dish. Ingredients: 1 ½ cup unsweetened almond milk, pitted dates, 2 tsps. vanilla extract, 1/2 tsps, pinch of ground cinnamon, little sea salt,2 medium bananas,1/2 cup unsalted almond butter, roasted almonds and berries to garnish. Instructions: Put almond milk, dates, cocoa powder, chia seeds, vanilla, cinnamon and sea salt, blend and transfer the mixture to a bow, cover and refrigerate overnight and serve. Strawberry Almond Milk Smoothie: This is a very easy recipe and good for the taste buds too. Ingredients: Almond milk, fresh strawberries, maple syrup, ice cubes. Instructions: Mix all ingredients in a blender, add ice cubes and serve cool. No-bake White Chocolate Raspberry Protein Cookies: These cookies are high in protein, sugar-free as well as gluten-free. This is perfect when you prefer to be a vegan. Ingredients: 3 cups oats flour,2 standard scoops of vanilla plant based protein powder,1/2tsp sea salt,1/2 cup peanut butter,3/4 cup brown rice syrup/honey,1/2 cup unsweetened almond milk, white chocolate chunks, dried raspberries and cranberries. Instructions: Line a large baking tray with baking paper and set aside. In a large mixing bowl, combine the oat flour, sweetener of your choice. In a microwave bowl mix dry ingredients, add liquid to dry mixture. Add the berries/dry fruits to garnish. Now with hand form small balls, press down in the shape of cookie, put them in the baking tray. Maple Pecan Granola (Gluten –Free): This is yet another favorite with the vegan as well as non-vegan food lovers. Ingredients:3 ½ cups gluten free rolled oats,1 1/2roughly chopped pecans,1/2 cup unsweetened shredded coconut, pinch of sea salt, little oil,1/3 pure maple syrup,1/4 cup brown sugar ,1/2 vanilla extract. Instructions: Process the pecans in a food processor and make a crumble. Add all the other ingredients and put the sticky dough is a square form in the baking tray and chill it for 2 hours and serve. For more such interesting recipes visit our recipes section at www.vidhiberi.com/recipes.